Turn on oven to 375. Melt butter in microwave or small sauce pan. In a large bowl, combine butter, applesauce, sugar and honey. Add eggs and stir. Add buttermilk (or yogurt) and whisk to incorporate. Using a sifter set on top of your mixing bowl, add baking soda, cornmeal, flour, and salt. Fold together. 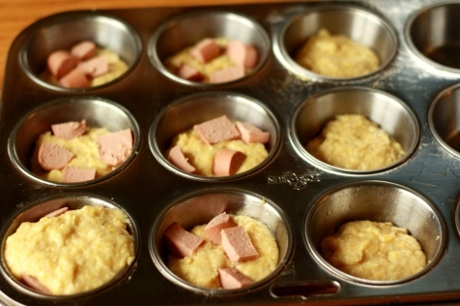 Grease muffin pan generously (using butter or non-stick spray) and fill each cup half full. Add a small squirt of mustard and a piece of hot dog. Top with more batter until cup is nearly filled. 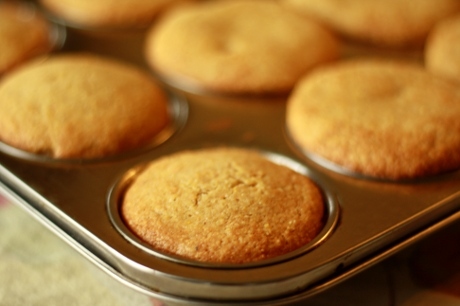 Bake for 8-12 minutes, or until cornbread is golden brown. Cool in muffin tin for 5 minutes before serving.